Ceramic Coating Maintenance Tips: How It Works. They have become extremely popular in a very short amount of time. Vehicle owners and car enthusiasts agree that cars look their best after an application. This coating gives the car an extra layer of protection along with an incredible shine that is sure to turn heads. Along with these benefits, there are also a few misconceptions. One of the main myths when it comes to Ceramic Coating is that they eliminate the necessity for regular car washes. Yes, ceramic coatings like Ceramic Pro will protect your car, but there are certain steps that you will need to take in order to ensure that the results last as long as possible. The coating will need to be reapplied on a regular basis but if you use a high-quality product, you may have to do so every two years or even longer. Depending on the weather, how often you drive, and other driving conditions, ceramic coating will wear down in places. This creates an uneven surface which means that light does not reflect directly off your car and some patches may, therefore, appear dull. Reapplying the coating creates a smooth surface and light reflects better, which is why your car looks perfectly glossy afterward. Over time, your vehicle is exposed to damaging elements. There is no way of controlling these elements, but you can take the necessary steps to help the ceramic coat last longer. When the coating is still relatively fresh, your vehicle will enjoy maximum protection against dirt, debris, and bug splatter. Once this layer wears down, however, the level of protection decreases and your car becomes more vulnerable to damage. This is why it’s very important to take your car to the carwash on a regular basis. After the ceramic coating is applied, you will notice how water simply rolls off your car. In some areas, the water will run off and in other areas, beads of water will form. This indicates a thoroughly sealed surface with maximum water repelling ability. This helps prevent various forms of damage including etching and staining. This water repelling power is related to something called ‘surface energy’. The lower the surface energy, the greater the water repelling property of the surface. Ceramic coatings are made to create a low surface energy which makes the water bead on the surface. That said, if the surface is contaminated, it will cause the surface energy to rise which will decrease the amount of hydrophobicity (water-repelling power). If the coating abrades significantly, it will also cause the surface energy to rise. Ceramic coatings are an investment. 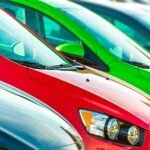 They help protect your car which means that they also help maintain its value. Since these treatments are complex and specialized, they should always be done by a professional. They also come with a higher price tag than your average wash and wax. All the more reason to do everything in your power to make sure the glossy finish lasts as long as possible. The key is to follow the right maintenance schedule and regularly inspect your vehicle. 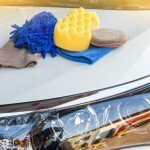 Regular washing is important for getting rid of contaminants before they can make themselves at home on your car’s paintwork. 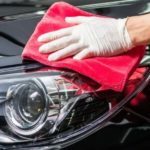 Because a buildup of dirt can result in a loss of hydrophobicity, it stands to reason that regular washing will rid your car of dirt and help maintain hydrophobicity. It’s important to ask the expert about the manufacturer’s recommendations when it comes to regular washing. Some manufacturers suggest a wash every 2 weeks but not all ceramic coatings are the same. You should also avoid washing too often as this will cause more harm than good. Over and above your regular washing, you can also inquire about maintenance booster products. These are hyper-concentrated formulas designed to be sprayed onto the coated surface. They fill in any minor imperfections and restore the gloss as well as the protection. This often makes people wonder why they should bother with the ceramic coating at all if they have to apply this spray every few months. Surely regular waxing will suffice? Well, not exactly. The quality of the gloss, water repelling properties, and the level of protection provided by ceramic coatings is far superior to that of wax. So, while ceramic is not invincible, it is the toughest of all and worth the investment. For professional Ceramic Pro coatings, contact Wash Me Now at (647) 607-5199. Our team is experienced in applying ceramic coatings on all types of vehicles including luxury cars, sports cars, electric cars, and everything in between!